Competition is hotting up in the world of wedding cheese cakes. Not the baked New York-style ones that you get in Pizza Express, but the towers of cheeses stacked on top of each other that seem to be obligatory at British weddings these days. Long the preserve of independent delis and cheesemongers, Waitrose has recently waded into the market with a pretty decent range of cheese cakes that can be pre-ordered from its stores, but I reckon you get a better level of service, range, often at keener prices, by dealing direct with delis, cheesemongers and online specialists. Plan for about 100g of cheese per person and expect to pay around £2 a head. There are more tips on The British Cheese Board website. This Devon-based business is literally run from a shed by Ian Wellens and was named Best Independent in the 2011 Observer Food Monthly Awards. 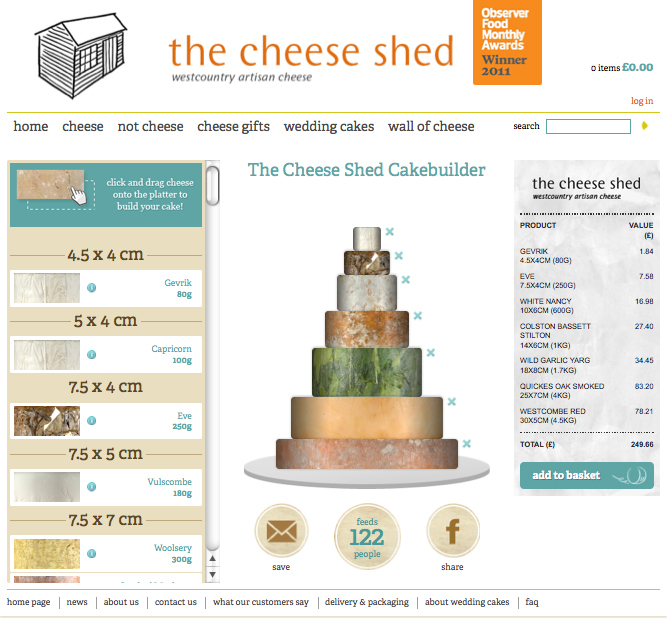 It has just launched its own online 'cakebuilder', which allows you to drag different cheeses onto a virtual plate to build your own bespoke tower. Not only does this mean that you can see what the finished cake will look like in terms of colours and size, but it also tells you exactly how many people it will feed and how much it will cost. Genius. Price: Off-the-peg cakes start at £67 for a 2kg selection to feed up to 25. Delivery: charge: Between £5.99 and £14.99 depending on the size of the order. This Wimbledon-based business supplies restaurants, delis and hotels with cheese, so has a huge range of cheeses to choose from. The website is easy to navigate with thorough descriptions and information about the cheeses. Rather than pre-designed cheese cakes, Norbiton prefers to offer a bespoke service, although there are a couple of suggestions to get people thinking. Adding little Crottin de Chavignol goats cheeses to act as pillars between the tiers on the cakes is a nice touch. 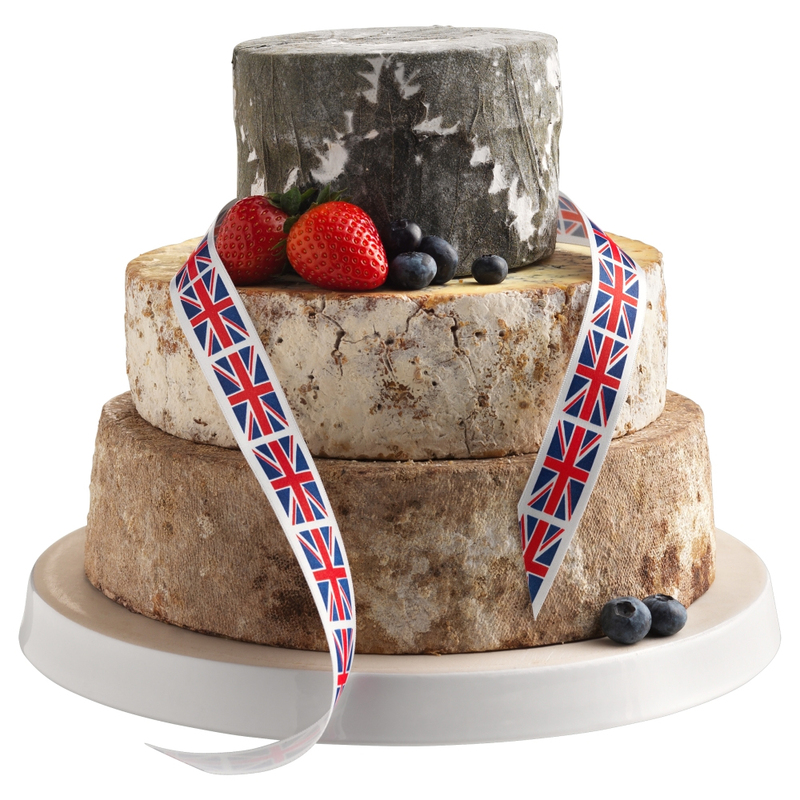 Price: A three-tier cake consisting of Cornish Yarg, Colston Bassett Stilton and Coulmmier would feed 50 and cost around £130. Debbie Priestley (right) has doubled the size of her cheese shop in Barnstaple, since taking it over in 2007, and has also built up an impressive online business. 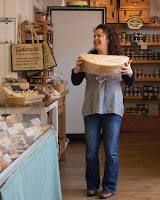 As the name suggests, the shop specialises in West Country cheeses from Beenleigh Blue to Montgomery's Cheddar, but it also does a decent range of cheeses from the rest of Britain and Europe. Debbie offers a bespoke service to fit people's personal tastes and budgets with some good advice online on how to decorate cheese cakes. Price: Start at around £100 for a cheese cake that feeds 50. Delivery charge: £8.50 within the mainland. Operating from its own cheese shop in Cheltenham, The CheeseWorks has a thoughtful selection of wedding cheese cakes with well-written descriptions of what you get, including the weight and how much they cost. I signed up to their monthly cheese club a few years back, which saw a selection of cheeses arrive on my doorstep once a month on time and pristine condition. Price: The entry level Holstein selection comprises Cerney Pepper, Cotswold Brie, Pecorino Rosso and costs £75 for 3.5kg of cheese, which will feed up to 40 guests. 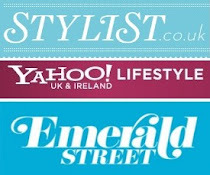 Delivery charge: £5.95 to mainland England, Wales and Scottish Lowlands. Has a large range of ready-made options based on what other people have chosen for their weddings or is happy to design a personalised cake, selecting from a wide range of British and Continental cheeses. 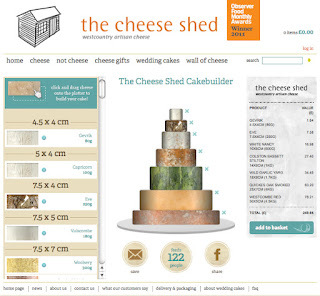 Because the company specialises in wedding cheese cakes, it really knows what works and what doesn't. 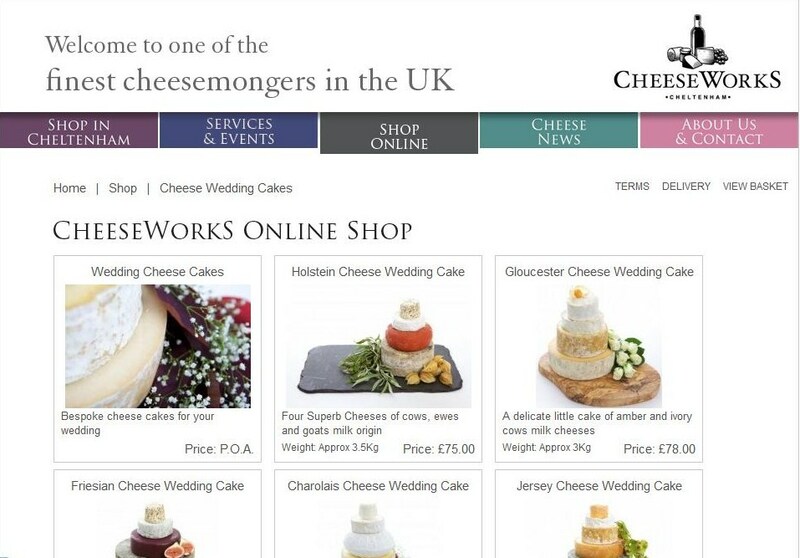 “There will be no sinking cheeses in our cakes,” it claims on the website. Price: A five-tier 'budget' cake is £105 and will feed around 40. Delivery charge: included in price.